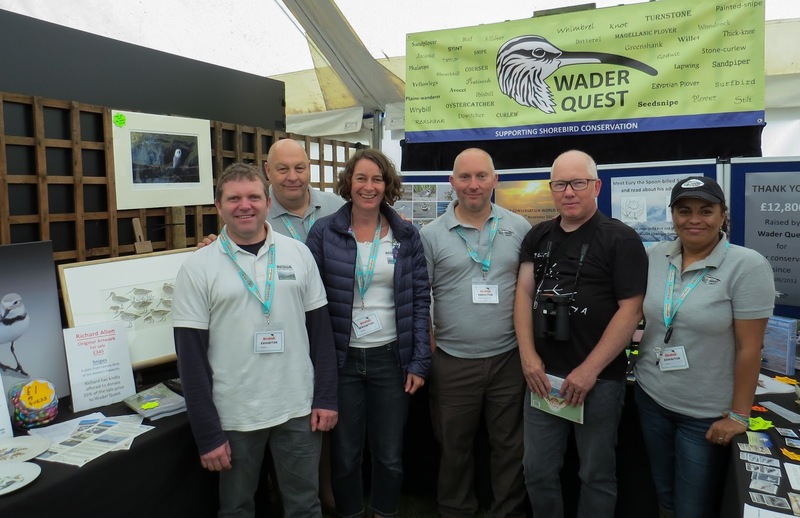 Wader Quest: Another great Bird Fair for Wader Quest. Another great Bird Fair for Wader Quest. 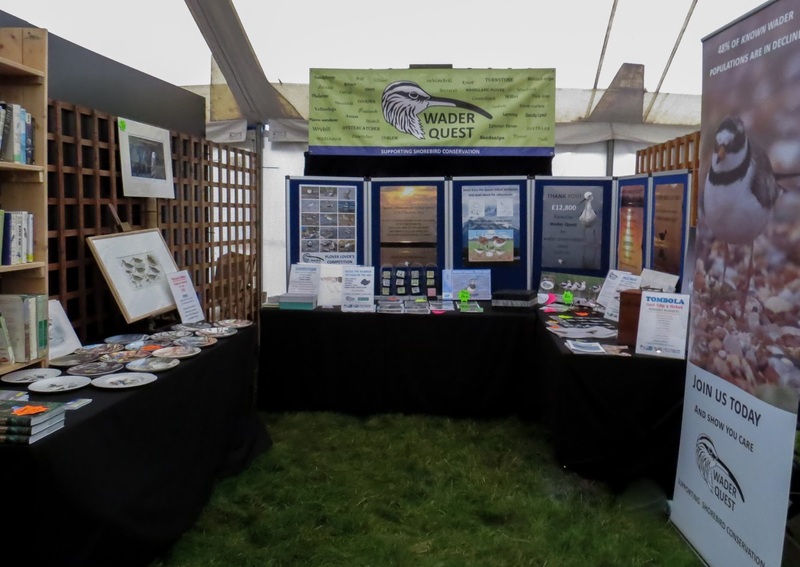 The first thing we must do is thank our Friends, Trustees and volunteers that came along to help us run the stand during the Bird Fair again this year. It makes such a difference knowing you have the support of people who have the interests of the charity at heart as much as we do. This year our thanks are due to Chris and Denise Lamsdell, Andrew Whitelee and Penny Insole. Also thanks to our other Trustees who were otherwise engaged at the fair on their stands but who took the time and trouble to come and support us, especially Ian Dearing who did a bit of 'off piste' recruiting! Special thanks are due too to the suppliers of the various prizes we had on offer; Opticron, Richard Allen, BirdLife International and John Lloyd. 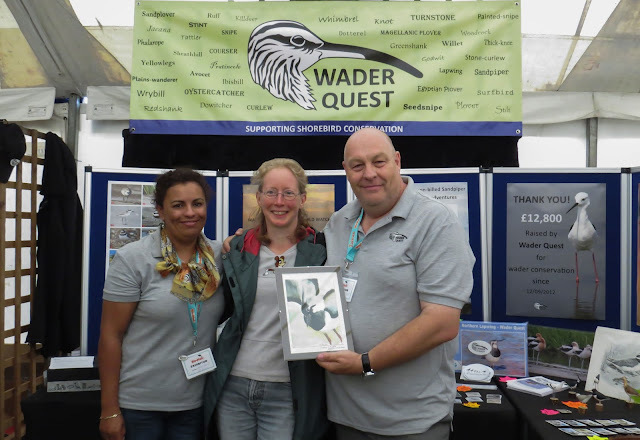 The Wader Quest team (or at least some of them) with the 'guess the number of eggs' competition winner Anastasia Smith seen here with her brother Nicolai and father Steve. Anastasia's guess was 304, the correct answer was 309. L to R: Penny, Nicolai, Steve behind Anastasia holding her Opticron binoculars, Rick and Andrew. We had a tremendous amount of support again this year with some especially generous donations coming from Sonia, Colin and Jo, Gail (via PayPal) and Bob. There were, of course, many more donations all of which were greatly appreciated as well. Interest in the Thai salt pan project was huge, many people specifying that their donation should, if possible, be earmarked for that. The project also attracted a great deal of interest from other organisations which wanted to lend their support in one way or another. There were also individuals who offered their services and expertise to make the project work and who will be seeking the help of their respective organisations and contacts in addition in some cases. Whilst it is far too early to be too ebullient about the chances of success, the signs are very good and we are greatly encouraged by all the support we have received, especially from those who know Thailand and the region well. It was also very heartwarming to have support from the bird tour companies that we happened to speak to that visit Thailand, who offered support. New Thailand salt pan project and donation jar. It was especially pleasing to put faces to so many names we have come across both from our personal correspondence and from our conservation activities. We would love to name them all but there were so many that we would be bound to forget someone and that would be unforgivable as we value all our friends equally. Here the team is joined by Mary Colwell, champion of the Curlews of the British Isles. Earlier this year Alicia Mottur wrote an article for the newsletter which was accompanied by her artwork. 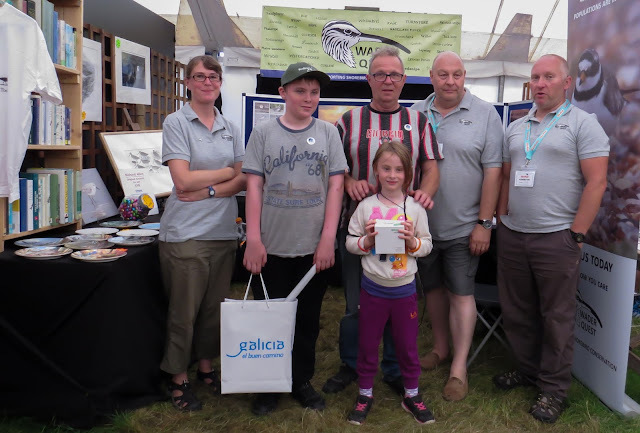 Alicia lives in Belgium and made the trip across for the fair and visited the stand several times, the last occasion of which she presented Elis and I with one of her paintings of a Northern Lapwing, a bird which has a special place in our lives, so a big thank you to Alicia for that. Rick and Elis with Alicia and her Lapwing artwork that she presented. 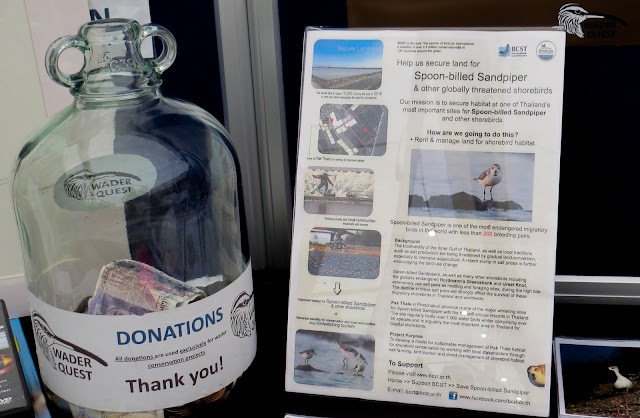 We sold a good number of the Eury the Spoon-billed Sandpiper books but of course still have some in stock (if anyone would like one, just drop us an email) the proceeds of which will go to the Spoon-billed Sandpipers; thanks again to Leica Camera AG for their support with the book project. We were surprised and delighted when none other than Chris Packham turned up at the stand and took the opportunity to explain to him what we are all about and greatly enjoying the chat we had with him; we extend our thanks to him for patiently enduring the inevitable photo opportunity. Thanks are also due here to Tina Lindsay of the Bird Fair for her friendly disposition towards Wader Quest and the multiple hugs we receive at the event. 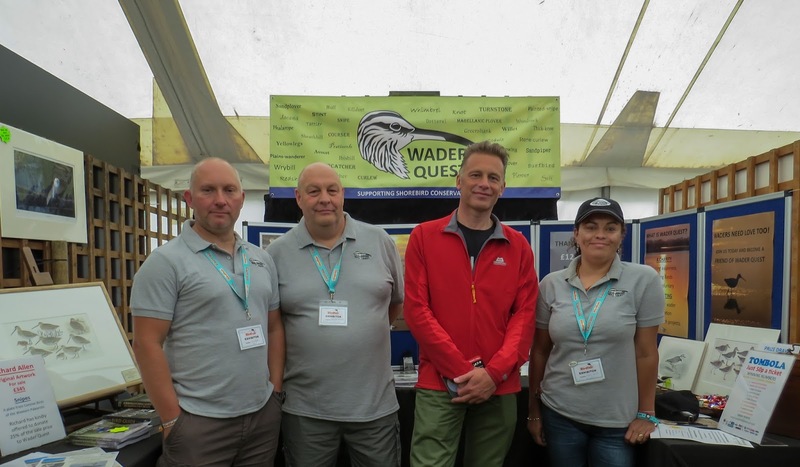 Chris Packham visits the Wader Quest stand. We did remarkably well again this year as far as fundraising and sales were concerned. 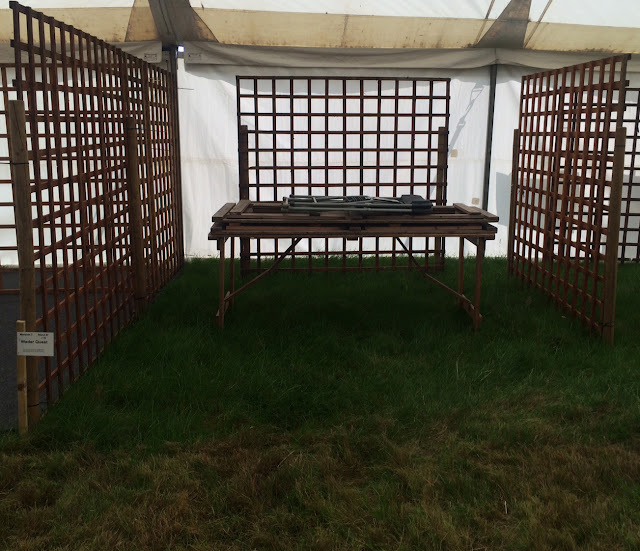 Bird Fair is the single most expensive event we attend which is paid for from money raised by the hard won revenue from car boot sales (affectionately known as the Mobile Charity Shop) and sales. Once again the money raised exceeded the outlay for the stand and display material (some of which we have to thank the generosity of the good people of Opticron for). Naturally a great deal of the income will be from sales, but so much has also come from donations, sign-up and renewals this year which means it will go straight to the conservation funds we are running. 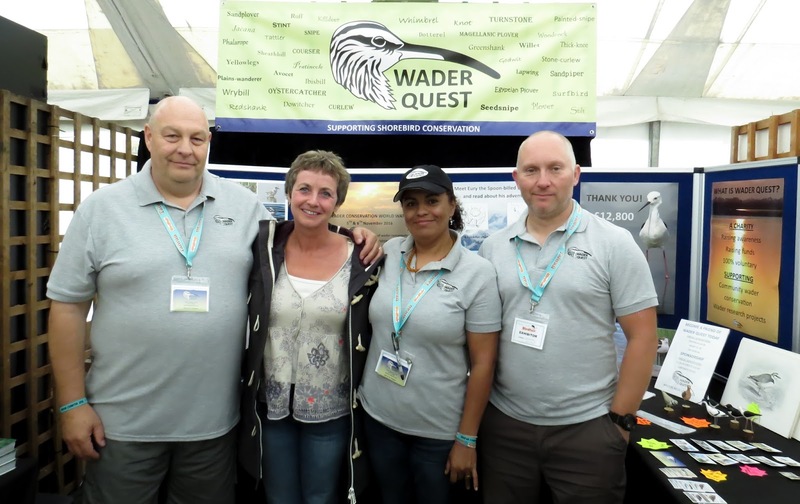 As always personal expenses of all Wader Quest representatives were met by the individuals themselves including, in some cases, the cost of entry to the fair, accommodation, food and fuel and for that we are extremely grateful to them and are humbled by their commitment to the charity. Impromptu Trustees meeting with some members of the board. L to R: Lee Dingain, Rick, Rachel Walls, Andrew, Allan Archer and Elis. The talk An Inspiration of Waders was well attended and seemed to go down well despite being last on the agenda on the Saturday evening. 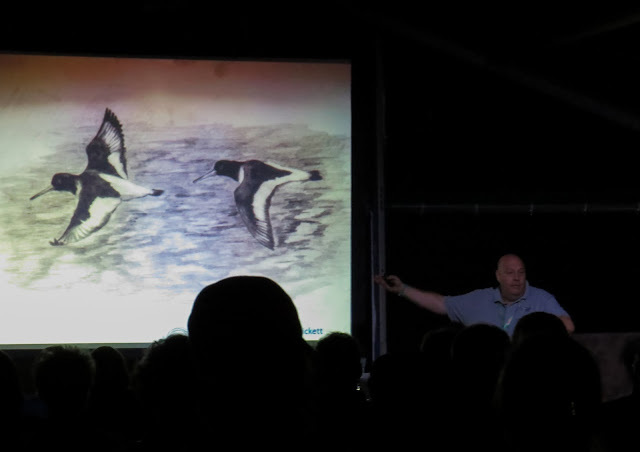 Here Rick is using a drawing by Gail Pickett, a Friend of Wader Quest, to illustrate how waders have inspired art. A big thanks of course to Tim Appleton and Carole Allen for another superb event and as we left we watched part of our little baby (Wader Quest) being carried off by Andrew and Penny who will be representing Wader Quest at events that we will be unable to attend, namely the SOC conference in Scotland and the Spurn Migration Festival. If you are in the area, please go along and support them if you can.